NUMBER OF P15 TICKET SHOULD BE EQUAL TO THE NUMBER OF REGULAR TICKET. Admission of guests: 5:00 pm to 8:00 only. 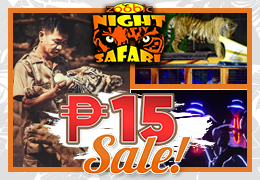 Night Safari Jungle Show: 8:00 pm.